Unlike a simple hair coloring, hair highlights can be magical and make a stunning impression. 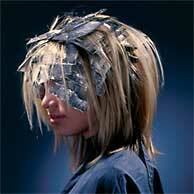 But also hair highlighting can be very technical and artful. You need to be very careful with the hair's shade and tone. Successful hair highlights also depend on your hair's health and texture, the amount of time the chemicals stay on and the number of hair highlights you want. Most people think of hair highlights as being one and the same thing with dying their hair. However, this isn't true. The first procedure consists of using "foil" as the name points out. It is meant to separate the strands that are to turn lighter in shade from the others that will remain natural in color. The hair highlights are created by using lightener onto the strand with a brush-like tool and then wrapping the strand into the foil designed for it. The second method of obtaining hair highlights requires using a brush or a comb to "paint" the color onto the strands of hair. The third method, "low lighting" is quite similar to highlighting. The only difference is that the result consists in darker shades used on the hair. This is usually preferred by light-haired people who prefer to eliminate too much brightness. This technique is exactly the opposite of getting light hair highlights. And last but not least, we have "chunking" which implies that you color your hair in chunks of different sizes. 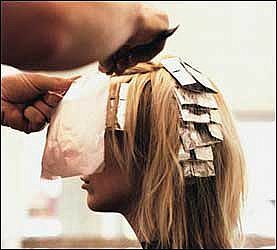 Hair highlights should be done in a salon by a hairstylist. Choices should be made after getting enough information on the characteristics of the hair. For example: lowlighting is often used to break up over-lightened hair and add dimension. Results can be a simple subtle change or a dramatic hair color makeover.